This unique farm park is superbly located on a stunningly scenic headland overlooking Cardigan Island near the sea-side resort of Gwbert. The island, 200 yards off shore is owned by the West Wales Wildlife Trust and unauthorised access is prohibited. It is inhabited by a flock of wild Soay sheep. Rare Choughs, which nest on the cliffs, can often be seen searching for grubs in the springy turf of the farm park, which becomes ablaze with wild maritime flowers, such as Thrift and Sea Squill during May and June. The cliffs are securely fenced to ensure the safety of children. 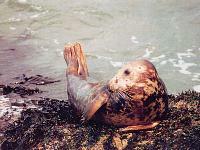 The Farm Park is the best place in Wales to view seals in their natural habitat in complete safety. A colony of Atlantic Grey Seals breeds in the many caves below the Farm Park, and can be seen at close quarters most days. They give birth here during September - October. The pups can sometimes be seen from the cliff tops. Bottle - nosed Dolphins are seen regularly from the cliff-tops of the Farm Park. Cardigan Bay has the only resident population of Bottle-nose Dolphins in English and Welsh waters. The Farm Park has friendly farm animals, with Ponies, Cattle, Wallabies, Llama, Emus, Rheas, Goats, Sheep and Lambs, Rabbits, Guinea Pigs, Vietnamese Pigs, Prairie Dogs and Kune Kune pigs. NEW for 2010Indoor Games for Wet WeatherPool Table, Table Football, Quiz Machine and more.Kids can have extra fun in the adventure playground, sand pit, picnic areas. M4 from Cardiff or Swansea to Carmarthen. Then A484 to Cardigan. Follow B4548 signs to Gwbert.